Daly Waters Pub was a lively place last night. State of Origin, game 2, rugby match was on. To the chagrin of the mostly Queensland crowd, NSW handily defeated Queensland. Brekky at the pub before cycling back to the Stuart Highway and northwards through the forest. Parts along the road had been burned, typically only on one side of the road. Numerous termite mounds and otherwise taller trees. Roads in NT continue to be excellent for smoothness, lack of cracks or potholes. Typically not a separate shoulder, but fairly wide road and light traffic help. After 50 km was a small monument to Alexander Forrest, who in 1879 crossed from Western Australia over to the telegraph line. I was first to stop, but soon half a dozen caravaners were stopped for morning tea/coffee break. I'm recognizing some of them who aren't going much further each day than I am. Discovered here that my rear tire was worn through rubber to the threads. Hope it lasts to Katherine. Route continued straight and level through the forest the last 40 km to Larrimah. Cross winds most of the day, with occasional head winds. Prior to Larrimah, I passed signs to WW2 Hospital #45 and then briefly paused at ruins of the Bulk Issue Petroleum and Oil Depot (BIPOD). Train tracks from Darwin were completed to Birdum, 8 km south. However, inaccessibility of Birdum during the wet meant that Larrimah became the rail head and end of the line. From here, goods and people transferred between truck and train. During WW2 some 60,000 troops were stationed in the NT and places like Larrimah served important logistical roles. Railroad was closed in 1976 after Cyclone Tracy (1974). Town contains a small museum (showing radio repeaters, railway and Larrimah history), a gas station with crocodiles and water buffalo, a caravan park and historic pub. Decided to stay at the pub. Definitely a quaint place. No room keys. Common shower room whose shower curtains have frog motif. Nice large cool veranda with some dogs sacked out on the concrete. Tourists occasionally pulling up and looking around at artifacts and relics spread about. French cyclist came a little after I did and is also staying at the pub. He had two flats today. 91 km today, 9769 km cumulative. Last night was what I'd call "small pub style" meal. These pubs frequently have fixed menu, e.g. chicken kiev, rump steak, burgers, ... and then often a special. Last night was schnitzel ($AUS 12). In addition, there will frequently be several types of salad for all meals. Larrimah gets between zero and twenty guests in a night and doesn't know until dinner time. Last night was a busy night with about fifteen and all the schnitzel was gone. Timing was a bit informal (when it is done) and all ate at common tables on the veranda. Following the guests, children some a few at the pub had their meal. In Larrimah, these four or five children attend "school of the air", a correspondence learning, originally via radio. No screens in the windows. Something bit me last night and I have a bunch of little red spots mostly on one hand. Left early as last of the stars disappeared and dawn broke. More humid cycling today. Saw some glimpses of sunrise, but then became very hazy and overcast. Surprising since later it cleared up completely. A few km north of Larrimah was Gorrie airfield, used during WW2. Terrain continued mostly flat, but also had some more gradual rises. Hard to notice other than how hard I needed to push. Forest with tall trees and seemed like it alternated between red and gray soils. After 30 km a brief pause and celebration. This trip is now longer than my Canada trip in 1997. Bypassed a rest area at 39 km and came across small ponds at 50 km. Still early as I cycled into Mataranka. Mataranka has a population of 600 and is the first town since Elliott. Nice small museum with mixture of homestead and WW2 artifacts. Checked the internet at the library and went to the supermarket. This area was setting for the book, "We of the Never Never", a classic Australian tale by Jeannie Gunn. After my visit to "the big city", backtracked 2 km and then 7 km off the Stuart Highway to the Mataranka Thermal Pools at Elsey National Park. Nice resort area with hot pools (34°C/95°F), restaurant, etc. Overall an easy day. 83 km today, 9852 km cumulative. Mataranka resort was a large operation. Seemed like over 150 caravans and a 30 room motel. During the evening, there was live music, mostly country. It seemed a little strange since many of the songs were American and then referred to US geography: Texas, Ohio River, etc. Left early and cycled 7 km back to the Stuart Highway and into Mataranka for brekky. Overcast and humid early, though it burned off later. On peaks in the south of Australia there was snow, but here the forecast was a high of 34°C (93°F) and a low of 20°C (68°F), so liked to get on the road early. Today continued more tropical forests with slight rises and falls in terrain. A sign described the area as containing an inpenetrable barrier of Lancewood that John Stuart had to cross in 1862. Still some areas that had been burned along the way. Less termite mounds. Traffic was heavier, though still not too bad. Also noticed more side roads along the way, particularly as I neared Katherine. I stopped briefly at a rest area after 70 km and then again when I saw signs for Cutta Caves at 80 km. A small visitor center. Unfortunately, the next tour wasn't for another 100 minutes, so headed back on the road. About 15 km before Katherine, I came past Tindal RAAF base. I saw jets overhead as well. Katherine has ~9000 people and was the most significant town since Mount Isa. 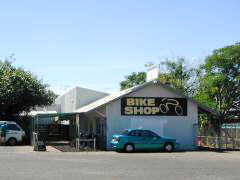 After finding a motel, the first stop was Cooper's Bike Shop where I purchased two tires, yeah! Otherwise wandered around downtown. 113 km today, 9965 km cumulative. Many of Katherine's shops are found in three blocks of downtown. In January 1998, entire downtown was under several meters of water. With exception of occasional "flood marker", hard to tell. From looking at flood measures on railroad bridge, that was a lot of water. The railroad from Darwin to Alice Springs is under construction again, with a projected completion in 2004. Ground was just broken on a factory capable of creating 1800 sleepers per day (sleepers are concrete railroad ties). Today mailed off computer disks and then rode my unloaded bicycle out to Katherine Gorge, 30 km east of town. Bicycle handled strange without the load, but also smooth with new rear tire. Some farms along the way, looks like growing hay for livestock. As got closer to gorge, more hilly to wind over. Despite a headwind, made good time and was early enough to sign up for 11am boat tour. Trees on the river banks had many flying foxes. These bats were occasionally fluttering their wings and also brushing against each other. Lots of loud screeching as they jostled each other. Katherine Gorge is narrow gorge with cliff walls around 40m high. I took the two hour boat tour which took us through the first gorge. Here we walked around a small rapids and boarded a second boat for the second gorge. Pretty scenery and peaceful boat ride. After boat tour, lunch at the visitor center and then rode back to Katherine with a nice tailwind. On way into town, passed Katherine School of the Air, but was too late for their tours today. Otherwise looked around town and relaxed. 60 km today, 10025 km cumulative. On the road again. Crossing multiple drainages today, so many little climbs and descents. Occasional rock outcroppings. The climbs meant an occasional chance to look over the wooded landscape. Trees were also a bit shorter. Winds out of the east which meant tailwinds for first half of the day and headwinds thereafter. Morning tailwinds help push me over the rolling hills past Edith Falls turnoff at 42 km and in to Pine Creek at 91 km. More traffic today. There was a surprising difference in speeds. Some caravans would pass at ~10 km/h over my speed. Other cars would zoom past, clearly taking advantage of lack of speed limits in NT. Mid-morning had a pair of road trains pass very closely. First one pulled over to give me a little room, but next one behind him didn't pull over much at all. Whoosh! I bailed out onto the shoulder and yelled at him in vain. Pine Creek was another town establish by the overland telegraph. However, town really boomed when gold was found in the area. Many Chinese were brought here to work the mining claims. Many were signed up for a two year contract, but stayed in the area. Chinese also worked on railroad as it was built through the area. Pine Creek had nice hotel, a museum and old railroad exhibit. I asked person at railroad exhibit if the new Darwin to Alice Springs railway would come through the area? Nope, new railway is high speed trains traveling 150+ km/h. He expected the tracks to be completed ahead of schedule, due to incentives offered. Decided to keep going after lunch and turned onto Kakadu Highway. This route had a number of small hills and wound back and forth. On the horizon, I could see haze from bush fires. Headwinds and hills meant slower progress, but made it to Mary River Roadhouse by late afternoon. 149 km today, 10174 km cumulative. Today a peaceful day riding through Kakadu National Park. Had brekky at the roadhouse, so left a bit later. I crossed over the Mary River and was soon at entrance to Kakadu National Park. Camera batteries were dead, so no pictures (last set of batteries didn't last long, so either bad batteries or short in the camera). Kakadu contains lowland areas and higher plateau areas with a steep escarpment stretching nearly 500 km through the park. Started off cycling in lowlands before climbing up ~120 meters to highland areas and entrance station. I've been seeing a new type of termite mound. This one 3-4 meters tall and 1.5 meters in diameter with fins. Wow! A few kms past the entrance station, descended back to lowlands, where stayed rest of the day. Fires still burning in the area, came past a few places still smoldering. Most of this area was forest with grass below. After 40 km, I crossed over the Aligator River. Prominent signs with crocodiles and "no swimming". Here was a rest area and good place for a brief stop. After break, continued cycling through forest. Mostly a cross wind, but varied quite a bit. The road came close, but never quite climbed to the escarpment again. I was ready for a stop on reaching the Cooinda turnoff at 98 km. There is a nice Warradjan Aboriginal Cultural Center, with interesting displays. Stopped here and made reservations for three nights, two camping and one in the motel. Will use this as base camp to see a little more of the park. 102 km today, 10276 km cumulative. Spent two rest days in Cooinda to explore Kakadu National Park a bit further. I took a cruise on the Yellow water at sunrise. Much of the Alligator river lowlands are vast wetlands, with up to 5m height difference between wet and dry seasons. Wonderful wildlife habitat. As the dry progresses, wildlife becomes more concentrated in smaller areas. On our trip we saw five saltwater crocodiles, two wild boars, barramuni and other fish, snakes and around a dozen different species of birds. Sea eagles, night herons, egrets, kingfishers, whistling ducks and jabiru are a few of the numerous birds we saw. One day I signed up for a trip to Jim Jim Falls and Twin Falls. Our driver was ready at 7am with his 4WD Toyota Land Cruiser. Seven paying guests and a tour guide trainee along. Two Germans, two Swiss and two Australians from Perth. Turnoff to Jim Jim was about 10 km past Cooinda. First 50 km was a nice gravel road and would have been fine on my bike. Here the 4WD section begun, deeply rutted and through half a dozen deep water holes up to a meter deep. Would not have been fun to cycle that! After 10 km, came to parking area for Jim Jim. The falls were located about 1 km walk along the valley. Came around a bend and saw the waterfall. Impressive! Water coming from 205m high falling into a deep plunge pool. Guide dared us to swim, but only two did. Mostly due to cool temperatures, though there was also large saltwater crocodile traps nearby. Apparently, only a few resident freshies normally. From Jim Jim, another 15 km on the track to Twin Falls. These falls only accessible by water. So after 200m walk, put on swim gear and got out boogie boards and flippers to swim through the gorge. Peaceful gliding along and around a bend there were falls. Beautiful! More water, but lower than Jim Jim. We stayed at Twin Falls for a few hours including lunch. Swam as close to the falls as I could without being pushed back by the blast. Relaxed and swam before backtracking via swim, 4wd and gravel road to Cooinda. Otherwise, walked around Cooinda, visited the aboriginal cultural center again, read (finishing Jeannie Gunn's book, We of the Never Never, about this area in 1902) and relaxed in Kakadu. Cooinda lodge had an interesting evening slide show about Kakadu and also a Quiz Night. I was on team with some caravaners from Canberra. Our team tied for lead after normal rounds, but lost in the runoff. Nice early morning ride through "savanna woodlands" as they call this habitat. Saw a small wallabie hopping along. He saw me too, hesitated and decided to hop off. 4 km back to the main road and then 26 km towards Jabiru. I took the turnoff to Nourlangie Rock, located 12 km off the main road. This area is high rocky area separated from the main escarpment and containing many aboriginal "rock art" paintings. Kakadu has been lived in by aborigines for tens of thousands of years and contains at least 5000 such sites. Some are fairly recent, depicting guns, ships and other signs of European settlers. Others much older, showing tools or animals from times during past ice age when climate was drier and trees more sparse. I listened to the guided talks about the rock art, culture, flora and fauna of the area. A 1.5 km round trip walk along the escarpment came past several areas. Packed up and headed back to the main highway. Another 21 km to the Bowali Visitor center and walk through some interesting exhibits. From Bowali, took a shortcut to Jabiru. The bike path was extremely bumpy, but otherwise nice through the forest. Jabiru has a large supermarket (kangaroo meat for sale, but not crocodile), library, gift shops and other amenities for town of 1500. A bit separated though. Crocodile Hotel was fancy, even taking reservations for dinner. In contrast, this evening accomodation at Bark Hut Inn less than double cost of brekky at the crocodile. All day today riding westwards through savanna woodlands. Crossing over the drainages, so very gentle rises and descents. Termite mounds changed back over to large 3m type. Several road trains carrying ore, full westbound and empty eastbound. After 38 km crossed over the South Alligator River again. Here it is broader than at Cooinda and also a salt water estuary. Signs said "Crocodiles 5 km", so not too much stopping until Frontier Kakadu Village at 44 km. This was another resort area with motel, caravan park, restaurant, store, etc. Kakadu is 19804 square kms, larger than Yellowstone National Park (8806) or New Jersey (19342). Kakadu is owned by traditional aboriginal owners. They lease it back to the Federal Government. It is jointly managed by board of both aboriginal and government representatives. Average annual rainfall is 1300mm. During the wet, 30% is under water. Wildlife found includes 1600 species of plants, 10000 species of insects, 280 species of birds, 25 species of frogs, 51 species of fish and 62 species of mammals. Peaceful riding last kms to reach Bark Hut Inn by mid-afternoon. Some of it along a gas line. Fenced in area with emus, pigs and cattle. Through the afternoon, much pass-through traffic stopping briefly. 139 km today, 10491 km cumulative.